This Bariatric 20" Mobile Commode is constructed from a sturdy steel structure, with a chrome plated exterior for a smart look. It comes with detachable arms, allowing for easy transfer out of the side, an easy to remove upholstered seat, and the back is also detachable for storage purposes. 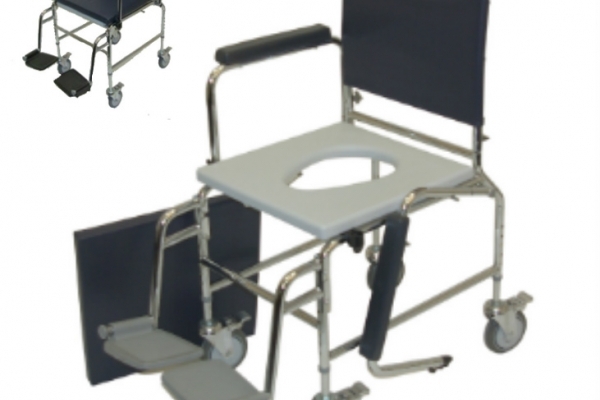 The commode comes with 4 swivel brake castors for easy movement and control, and hook-on footrests on the standard model. The commode features moulded arm pads for additional comfort, as well as an adjustable height facility to cater to a wide range of different heights and builds. Hook-on Footrests supplied as standard.